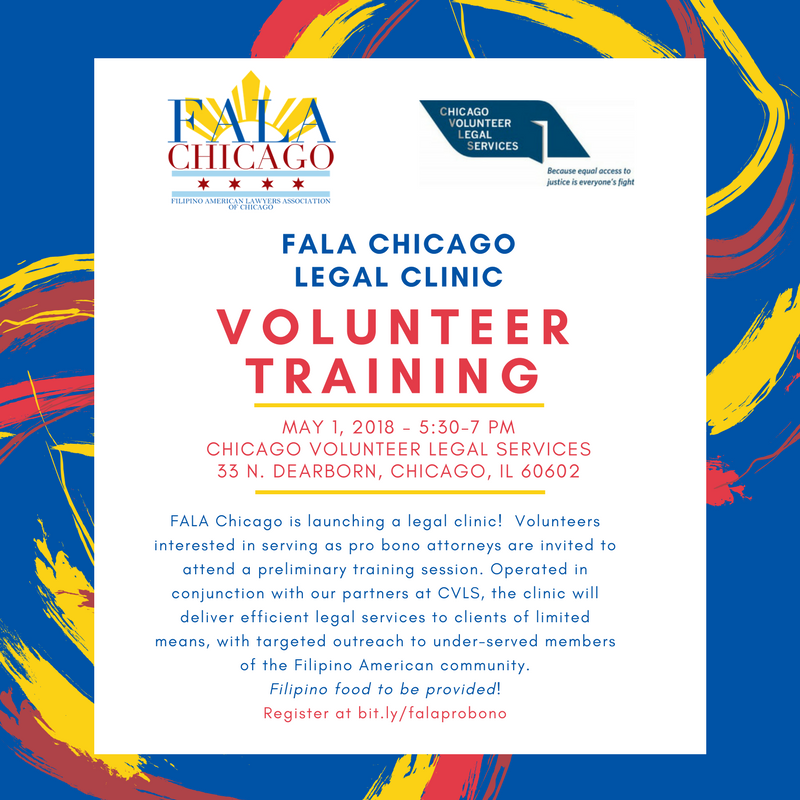 Attorneys interested in serving as volunteers for the newly established FALA Legal Aid Clinic are invited to attend a training session on Tuesday, May 1 hosted by our partner Chicago Volunteer Legal Services (CVLS) from 5:30-7:00pm. Filipino food will be catered! Operated in conjunction with CVLS, the clinic will deliver efficient pro bono legal services to clients of limited means, with targeted outreach to underserved members of the Filipino American community. Volunteers can expect to handle matters involving elder law & estates, family law, and landlord/tenant law. No experience in these practice areas? No worries! CVLS works closely with its volunteers to provide resources and mentorship, giving you the chance to hone current skills or learn new ones, all the while giving back! The clinic itself will kick off on Saturday, May 5 from 2-4pm at the offices of the Alliance of Filipinos for Immigrant Rights and Empowerment (AFIRE), located inside the HANA Center at 4300 N. California Ave. in Chicago. While attendance at the May 1 training session is required to volunteer as pro bono counsel, training is not necessary to volunteer administratively, or as a translator, so please come and/or spread the word as any help is welcome. Additionally, a public info session will take place on Saturday, April 28 from 2-6pm at Seafood City (5033 N. Elston Ave.). Community members will have an opportunity to meet and eat with representatives from FALA while learning more about the clinic. Please spread the word! If you have any questions about the May 1 training or May 5 Clinic, please do not hesitate to reach out to either Janice Dantes (jdantes@gmail.com) or Xavier Vergara (xavergara92@gmail.com).